Childhood Development - Do seats, jumpers and walkers help or hinder? You are here: HomeUncategorized Childhood Development – Do seats, jumpers and walkers help or hinder? Childhood Development – Do seats, jumpers and walkers help or hinder? Childhood development is something I get asked about a lot. As a paediatric Osteopath I am regularly being asked if certain pieces of baby equipment are good or bad for a childhood development. There seems to be an overwhelming choice of products which claim to assist with childhood development for sitting,standing and walking – from moulded seats to door frame bouncers. As well as being expensive there seems to be a lot of confusion about how useful they are or if in fact they could be doing harm. This post is only designed as guidance – not preaching. We are neither endorsing nor advising against the use of any particular piece of equipment for childhood development but merely trying to educate parents so they can make informed choices. In order to understand how such equipment could affect your child’s development and posture you first need to understand how your baby learns to develop from a newborn baby completely dependent, to a toddler who is unstoppable! When your baby is newborn they are not capable of voluntary movements because their brain is still immature – it takes practice to get used to the world. Instead your baby’s movements are controlled by reflexes (primitive reflexes) – some of these are for protection and survival (such as suckling) and others are precursors of learning to move. Your baby needs practice at wriggling, moving his arms and legs around and lots of different stimulation in a variety of positions (lying on their tummy, sitting up and lying on their backs) to work out which movement patterns are useful and worth practicing and which are no longer helpful. Over time these reflexes get overwritten or refined to gain voluntary control of muscles and movement. If you were planning a journey to a new city (let’s imagine days before sat navs) – would you just get in the car and randomly drive around, hoping that by coincidence you’d stumble across where you wanted to go, or would you look at a map? A map is just the organised view of where one place is in relation to another, helping you to make sense of the world. Unfortunately your baby has to draw his own “map” of the world around him and how he fits into it. This takes time, patience and practice. From the moment your baby is born massive amounts of sensory (sight, hearing, taste, touch) information is coming into his brain. In order to interact with the world he needs to organise and make sense of this information and his experiences. All over your body are tiny receptors which tell your brain where different parts of your body are in relation to each other and the environment around you. In order for your baby to build this “map” he needs to repeat experiences, interact with the world through all of his senses and have freedom in all degrees of motion to explore the world around him. Information from his hands and feet are vitally important to understanding how he relates to his environment. He starts to learn where his hand is in relation to his mouth or how far a toy is away from his out stretched hand. 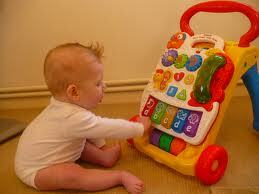 Childhood development is gained through a process of trial and error. He starts to use his senses and experiences to build a map, which he can then use to start controlling his body movements and interacting and with the world at his will. Childhood development is a process and each stage teaches your baby new and important skills that will help him with the next stage. Each stage must be mastered before moving onto the next stage. Many parents will be aware of the high density foam seats, with a high back and sides and holes for the legs, which enable your baby to sit up right. From looking at various parenting forums they do seem popular for helping with feeding, playing and as somewhere to safely place your baby whilst you do other “luxury” tasks such as having a shower or going to the toilet! Babies usually start sitting on their own at around 6-9 months and aren’t able to correct their balance when seated until 9-12 months. These seats are supposed to be suitable for babies below this age, who can’t sit unassisted without the seat. I have looked at images of young babies (below 6 months) sitting in these seats and feel that they look as if they are slumped in the seat and don’t seem to be “actively” sitting using their own muscles, probably because they haven’t developed sufficient control over them yet. Sitting isn’t just about strength, even a newborn has sufficient strength to lift himself but he lacks the sequenced neurological control, muscle control and balance to perform the task (Carreiro 2003). This neurological control can only be gained through practice. Having the feet in contact with a firm surface (which isn’t possible for small children in these seats) helps them to establish better balance and muscle control to assist with sitting (Hayden 2000). It goes back to the “sensory map”, it provides a bit more information about how he relates to the space around him. If your baby isn’t yet coordinated enough to sit independently they will tend to slump when placed in equipment which requires/encourages sitting. The signals then traveling to the brain about seated posture are not accurate. Your baby has no conscious urge to sit up straight so sitting in a slumped, rounded “C” shape posture can become habit (Hayden 2000). During normal childhood development, your baby first learns to sit with a rounded “C” shape spine, until they get stronger and learn to coordinate their muscles. When assisted to sit by a parent, your baby will naturally tire quickly and not be able to maintain the position for long. In the moulded seats or other equipment which supports your baby in a seated posture, this fatiguing is not obvious. They are prevented from being able to shift or move position. Sustained sitting, without the ability to shift or move increases pressure on the ligaments and discs of the spine. Weck (Clinical Coordinator of Children’s physiotherapy, Children’s Memorial Hospital Chicago) made the observation that, even in older children the seats seem to encourage the pelvis to tip backwards, rounding out the lower back. This means the chest sits behind the pelvis and it encourages the head to stick forwards. (Deardoff 2012). Again this “slumped” seated posture puts pressure on the joints and discs of the spine. But sitting is a huge leap forward in childhood development. It enables your child to have a different view point of the world and frees up his hands to explore, which helps add another layer to his “map”. Learning to sit and balance actively is vital in order to move on to the next stage of learn to stand and walk. 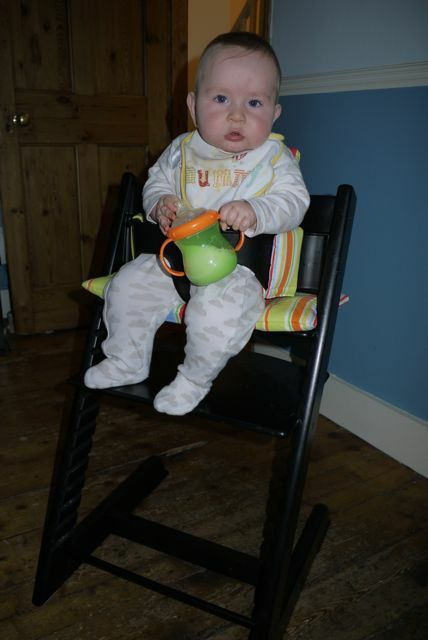 A great alternative to moulded seats and even high chairs are a Swedish product called Tripp Trapp chairs. Tripp Trapp chairs have a fully adjustable seat and foot support so it grows with your child, even being suitable for adult use. 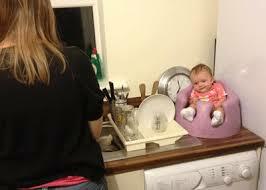 It can be used from 6 months and allows your baby to sit with you at the table. Having the foot rest is a crucial feature, enabling your child to use feedback from the contact of their feet with the floor to stabilise themselves and encourages good seated posture. The same child sat on the floor, without their feet in contact with a firm surface, would find it harder to sit up and maintain balance (Hayden 2000). Traditional baby bouncers are also a good alternative if you need a younger baby to be seated and safe for short periods of time. They still allow freedom of the arms and legs and the baby has the ability to wriggle more. Remember childhood development is a process which is best done one step at a time and there is no advantage to encouraging children to “miss out” or short cut anyone of these steps, they are all important for moving onto the next stage. The balance and coordination he acquires practicing sitting without any additional supports, helps him learn to balance so he can stand and walk. From quite an early age you will have noticed that your baby can support his own weight on his feet and very quickly will start to bounce. This is great practice at learning how to use their feet and legs. When you are holding a baby and allowing them to bounce you will get tired and encourage the child to either try a new activity or change their position. There is a natural limit to the work load going through your baby’s legs and back (Hayden 2000). Baby jumper and walker equipment don’t allow for this natural rest and if you do decide to use them then your baby shouldn’t be left in them for prolonged periods. Using baby walkers with a child who is as yet not able to coordinate sitting unassisted yet, encourages them to slump into the seat of the walker, which is not good for their spinal joints. 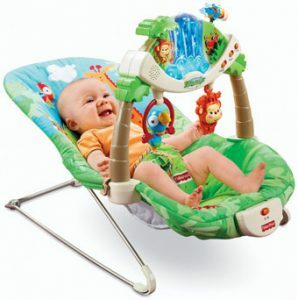 Baby walkers also allow your child to become mobile earlier than he would naturally be. He might find this great fun as he gains new independence but it takes time away from and discourages him from learning to sit effectively and to crawl. Crawling helps with the development of natural spinal curves, the foundations of good posture later in life. But crawling isn’t just about getting about. Crawling is very important in childhood development because it involves cross patterning – doing opposite things with the left and right sides of the body. This is not just good news for getting about independently but is also helps to “wire” communication between the left and right sides of the brain, which is vital for processing and more complex tasks such as reading, writing, understanding complex instructions and co-ordination (Carreiro 2003). Some children only crawl briefly and others only learn to crawl once they have started walking but time spent playing with your baby on his tummy and encouraging him to crawl is so important. (Hayden 2000). Equipment which replaces the need or desire to crawl and takes time away from lying on his tummy and practicing to crawl, should definitely be kept to a minimum if used at all. Walking independently or with minimal support of the hands requires your baby to have sufficient balance, coordination and hip joint development. He must be able to control his upper and lower body independently of each other. It isn’t easy and it can take up until the age of 7 before this process is completely matured (Carreiro 2003). Many of you will be reading this and thinking, well it’s all very well in an ideal world but perhaps you have other children to attend to, jobs you need to get on with or just need a break from time to time, so what can you do? How can you support the development and posture of your baby? Ideally your baby should spend most of the day lying in various positions and encouraged to play, move wriggle and reach for toys. It’s important to remember that childhood development isn’t a race, it takes time and it’s a process where one step is necessary to move onto the next. Your baby will learn to move and develop in their own time – but it doesn’t mean they can’t have fun trying. Play time on the floor, in lots of different positions, including supervised tummy time, is perfect. Tummy time is suitable from birth as long as you don’t allow your baby to sleep on their tummy and you supervise them at all times. It encourages the development of head control, the first step in developing up right posture and is essential to be able to do before he can sit, crawl or stand. Baby gyms and play tables: Allowing your baby time to entertain themselves sometimes, encourages them to explore and reach for things and work out how they can manipulate the world around them. Baby carriers and slings can be great if you need to get tasks done around the house – I will be doing a follow up blog on carriers and what’s best for you and your baby, so look out for this. Create a “Yes space” for your baby. An area border by cushions or furniture where all hazards are removed. Put different toys etc. around the space and encourage your baby to explore, where nothing in that space is off limits. Using a circular baby gate or a play pen can be great for this too. Play pens do take up a lot of room and not everyone has the space but they are great as a safe place to put your baby whilst you do other task but which doesn’t inhibit their ability to play, move and learn. Traditional baby bouncers are suitable for short periods of time. They still allow your baby to initiate their own sense of movement but still keeps them in a safe place, without putting undue pressure on their joints. This blog isn’t designed to be dictatorial in what you should or shouldn’t do but hopefully can help you make an informed choice about which equipment you decide to use and how long for or perhaps to highlight some alternatives that you might not have considered.